friend. first thing is first… it took me a long time to be able to breathe + write this. why? well. we relocated (once again) from the deep South to the Pacific Northwest. relocating isn’t something that’s new to the hubster + I. one of my nickname’s in the family is the “Cajun Gypsy” which is rightfully earned because over the course of our marriage (12 wonderful years), we have lived in two countries… 8 states (one state, twice)… and 12 homes. however, this travel was a wee bit different. how? well. instead of moving DIRECTLY to our new location which is Washington, we had a three week transition period in Idaho for the hubster’s work. it was odd. packing boxes for our new home in Washington… for our three week stay in Idaho… and a 3 day road trip. plus. when the movers arrived, they didn’t really understand the boxes labeled WASHINGTON and IDAHO. and packed ALL the boxes in the moving truck (even though I was planning on taking the boxes labeled IDAHO with us in our vehicles). it was a MESS. and I’m still recouping as the movers have YET to deliver our stuff. it’s only been a MONTH without our things. yes, ladies and gentlemen, we have been living out of a suitcase for the past month… which means we have worn the same three outfits over. and over. and over. and over. again. which I am grateful for the clothes we have and the roof over our heads. and most importantly, I am grateful we are altogether. it’s just comical + frustrating. especially when the hubster looked at me the other day and said, “these pants little man is wearing needs to be tossed, he has holes in the knees.” I calmly looked at him with a smile and said, “yes, as soon as the movers arrive with our boxes, I’ll toss them out. otherwise, he will wear them.” I know. I am refusing to purchase new pants for my son because we have a SLEW of clothes coming soon (I hope) in those boxes. and if you are wondering if I would do the same to my pants… yes. yes. I would. I can say this with 100% certainty because the two pairs of workout pants I packed for my three day car trip both have holes in inappropriate spots where I can not wear them out in public! YIKES! anywho. besides all the drama with our move… I’d love to share with you some tidbits on how we are keeping on track with our healthy lifestyle PLUS some things I am loving + can not live without. but if you have a beat, any positive vibes + well wishes towards the movers bringing our stuff would be greatly appreciated. here are some tidbits on what I found helpful to bring along on our 3-day CROSS COUNTRY road trip with two geriatric canines + twin 5 year olds… (yes, we are crazy)! canvas insulated tote: to bring healthy snack options because let’s be real, the gas station RARELY holds nutritious food items besides the $2 banana! WHAT? loaded with boiled eggs, veggie sticks, berries, turkey slices, cheese sticks, sandwiches, etc. extra set of clothes placed under the drivers set in a ziplock bag: this is super handy when traveling with wee ones BUT if I had to change one thing I would have added an extra set of clothes for MAMA. why, oh, why did I not bring clothes for ME, too! I’m the one who gets slobbered on my the dogs… who had coffee spilt on her scrub pants… who was got sneezed on, etc. next road trip: mama packing clothes for her. note: ziplock bag is warranted because any stinking clothes will be placed back in the ziplock bag after changing. you are welcome. toys/gadgets/books: this was super handy for the Gillies and keeping them entertained on the road trip. we had packed car-trip toys and placed them behind the driver/passenger seats in the truck, so they could access them with ease. we even used a small baking sheet for them to use + draw on with dry erase markers. other toys were purchased on Amazon + I’ll share below the toys which they loved! podcasts/audiobooks: before our trip, I wrote a list of podcasts I wanted to listen to on the trip for business, entertainment, nutrition based, etc. plus, the hubster + I each downloaded one audiobook we wanted to listen to… which was helpful since we ended up mid-trip NOT towing one vehicle and driving both! so instead of talking with one another, one of us was driving SOLO… which makes a 34hr road trip. pillows/blankets: this came in super handy as we drove thru Wyoming and Montana… because we were greeted with unexpected snow storm. we made sure to have an extra pillow and blanket for each kid (as well as mama, although, I was driving and unable to use it). oh snap. the one thing I should talk about here is the importance of HYDRATION, especially while traveling. now, you probably heard that most Americans are chronically dehydrated which astounds me, but when you think about it… it makes sense. We tend to reach for caffeinated beverages over water to drink. hello, Pumpkin Spice Lattes over at the bucks of Stars?!? I am reaching for caffeinated beverages to stay AWAKE! Hello, caffeine will make you urinate MORE because it’s a diuretic. Not wanting to drink as much because I don’t want to have to stop for bathroom breaks. or something else. but you get the scene: dehydration sets in + then mama gets a headache (reaches for caffeine or sugar), mama gets cranky… lips start feeling dry, mama gets a cold sore because I’m blessed with that capability… mama starts being a wee bit snippy + now, no one is having a good time - all because mama is drinking her water. so. 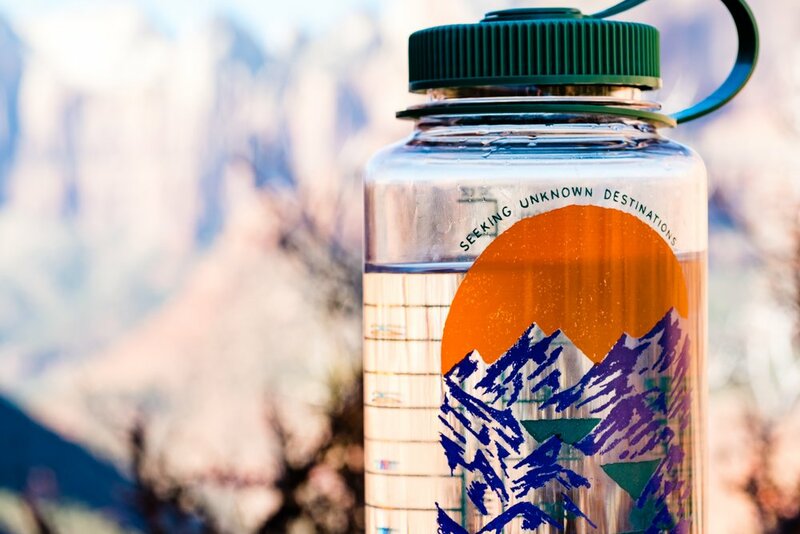 here are some of my tips to staying HYDRATED while traveling. ie. 140lb woman = 70oz of water in a day! + avoid caffeinated beverages and alcohol IF you are able to on your trip! Now. I am curious… what are some helpful things YOU would bring on a car trip? Don’t be shy, shoot them this way or heck, message me on social media either IG or FB! I’m open to hear how I could make our epic road trips better! now. you can get all fancy and mix the trail mix up with a wee bit of maple syrup + some spices then bake together. but this is a quick, simple trail mix that’s super easy to whip up (even in the gas station parking lot) + filled with goodness for that pretty little noggin of yours: nuts, pumpkin seeds, blueberries and dark chocolate. so much GOODNESS! after a 34-hr road trip across some beautiful country… we ended up in the mountains up in Northern Idaho as I mentioned earlier. the views and foliage are simply breath-taking! I’ll have to admit I am falling in love with this state. however, it’s not our end-destination… we stayed in Idaho for three weeks while the hubster wrapped up some additional training. then headed out further west and north to the great state of Washington. we are still waiting on our boxes of goodies, sleeping on the floor in an Elsa princess sleeping bag and wearing the same pair of running pants (which I do wash each day, thank you) and San Diego t-shirt. anywho. the point is we made it safely to our destination…. we have a roof over our heads… and clothes on our backs. we are still a wee bit groggy from all the travels + catching up on our hydration and trying to find some sort of routine in our new residence. that’s apparently it. give yourself some grace and when you are able start falling back into a routine to set up a foundation for yourself. whether that’s setting up time in the morning for YOU to focus on prayer/gratitude, craving out 30 minutes for a workout, binge watching Netflix with the hubster when the kiddos hit the sheets… set time for YOU + start making a routine that puts a smile on your face. if you want to hear more about what I have in store or up my sleeve this fall, well… give me a second to “word vomit” on YOU. I’ve been working behind the scenes to create a digital magazine, aka. NO BRAINERS. sort of like a guide which focuses on optimal brain + gut health. it’s filled with nutritious (and simple) recipes, health hacks, green beauty tips and a wee bit more. now, the digital magazine is still in beta-testing phase… but if you’d like to keep in the know about the details + get your hands on the first copy (which comes out the end of December) then love, click the button BELOW! that’s all I have for you this week. mama still trying to get her feet on solid ground with the month of travel… setting up new doctors, dentists, dance classes, therapy sessions, post office box, etc. oh the joys of moving which no one every really talks about. if you want to follow our crazy adventures more, I go a wee bit deeper in our Brain + Gut Health Explorers community. otherwise, stay in the loop with snippets here where I’ll share next week some of our favorite recipes (which I’m making in our kitchen without pots, pans and a whisk as our only kitchen utensil! send prayers the movers come SOON!) and workouts that I’m following to keep mama sane and the MFP (mama-fanny-pack) at bay!